Please share your experiences with various IR receiver models and Windows 10. I don't want to recommend any IR receiver with poor driver compatibility or impaired function. 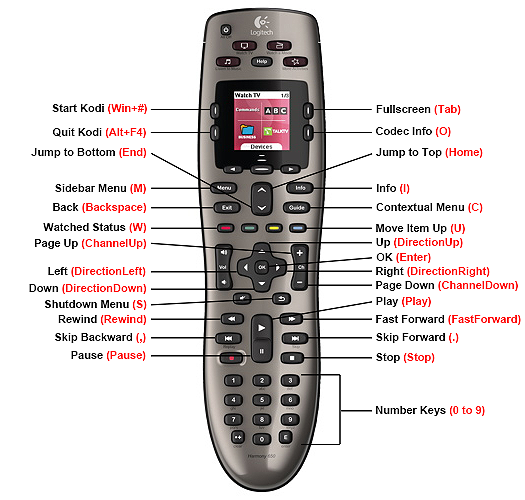 This guide is dedicated to configuring a Logitech Harmony remote to control Kodi Entertainment Center. Set up is specific to Windows. Linux users should start here before visiting this thread dealing with Harmony remotes. Mac users should rely on set up from this thread. 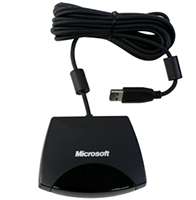 Definition: A Microsoft eHome Infrared Transceiver is a type of IR receiver designed to work with Windows Media Center, Windows Media Player and other native Microsoft media applications. This type of receiver is easiest to work with and the most compatible with Kodi. Its ease-of-use comes from its ability to use devices in the Harmony database that can be directly mapped to keyboard commands in Kodi without having to translate through a third-party such as a keyboard.xml. If possible, you want to get your hands on one of these. 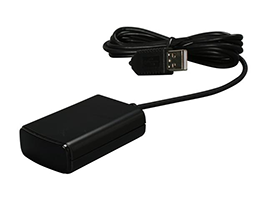 To determine if your IR receiver is a true eHome RC6, open the Device Manager in Windows and see if your receiver is listed as a Microsoft eHome Infrared Transceiver under Human Interface Devices. Even this may not be a guarantee of performance. 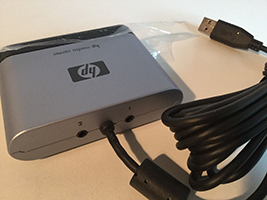 I have experienced an issue with an HP OVU400102/71, which installed the correct drivers but wouldn’t recognize commands correctly. It turns out, this receiver uses a different chipset than other HP receivers, and, as a result, does not function as a true eHome remote. 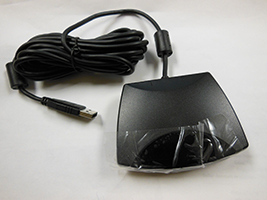 But, chances are, if the eHome driver installs, you have the correct receiver. Genuine eHome receivers can be purchased alone, but it may be just as easy to remove an IR receiver from a combined remote/receiver package. Many small form factor (mini) computers contain built-in CIR receivers, which are also RC6-compatible. Examples of computers with built-in receivers include the Intel NUC and ZOTAC ZBOX. A list of external Microsoft eHome receivers can be found here. Definition: A Non-eHome IR receiver also emulates keyboard commands and typically comes preconfigured to control Window Media Center. The limitations of a non-eHome receiver relate to how the device is stored in the Harmony database. Unlike a true eHome receiver, these receivers cannot use generic Microsoft devices. Therefore, they are limited to the commands on the remote itself such as “Red,” “Green,” “Play,” “Pause,” “Browser,” etc. Each button could send a command for a single key press (e.g. “i”), multiple key presses (e.g. ctrl + g) or an app command (e.g. play_pause). In either case, some key presses will have to be translated to Kodi commands through the creation of a keyboard.xml. Set up for Non-eHome receivers is covered separately in Section 5. Non-eHome receivers are usually packaged with an accompanying remote that will be needed to determine what key presses are sent by each button. Some examples of non-eHome receivers can be found here. It is possible to control Kodi without an IR receiver if you use a Harmony Hub-based remote. 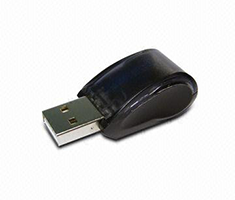 This involves using the Hub's Bluetooth pairing, which connects directly to the PC. The HTPC must have built-in Bluetooth or a Wi-Fi/Bluetooth dongle. Kodi may or may not be more responsive using Bluetooth. Instructions: Controlling Kodi via Harmony Hub & Bluetooth. MyHarmony: For newer remotes, delivering a visual-oriented approach to set up. 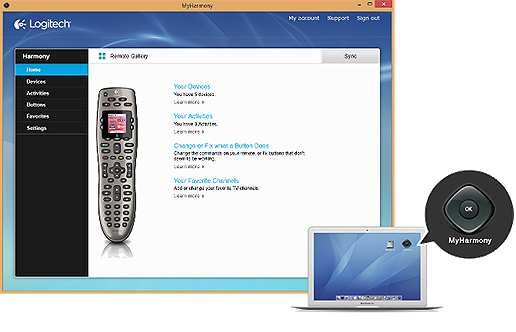 Logitech Harmony Remote Software: For legacy remotes, relying more on drop-down menus and tab-based navigation. You are not cheating yourself regardless of what type of software you use, as the options remain virtually identical between the two. Two devices should be added from the Devices tab. The first device, MCE Keyboard, is comprised of simple key presses found on the keyboard face. The second device, Windows Media Center SE, is pre-configured for Windows Media Center and includes numerous multi-key commands. Either device may work well on its own, and many commands are repeated across devices. To increase flexibility in designing a keymap, it is recommended to use both devices. Most commands for non-eHome devices are taken directly from Window Media Center. The command list will vary from device to device. Flirc Users: Users of Flirc should treat the receiver as a non-eHome device. Flirc has its own Kodi profile in the Harmony database: Manufacturer - Flirc; Model - Kodi. Any additional custom button mapping should be done with the Flirc software. Harmony Hub Bluetooth: If Bluetooth pairing is used, users of the Harmony Hub should also treat it as a non-eHome device. The correct device is: Manufacturer - Microsoft; Model - Kodi. Once the correct device is added, configuring the remote face is a matter of following the same steps as users with IR receivers. Choose Custom activity and follow the on-screen instructions. 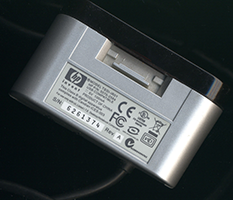 Power On and Off – Only one device should be used to power the system on and off. I recommend Windows Media Center SE for this purpose. Leaving the computer off when not in use is the recommended setting. The Off state may be wake from sleep/hibernate, or wake from a power off state if your motherboard supports this. To customize the remote, commands from the Kodi keymap must be matched to commands for a device in the Harmony database. Most key commands (e.g. "I") can be matched directly to the MCE Keyboard, so this process can usually be planned without looking up anything in the Harmony software. 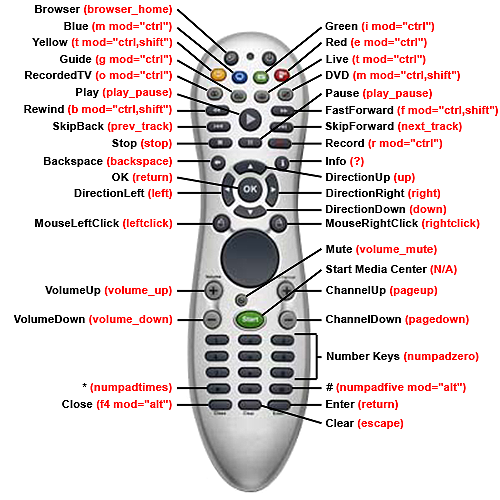 The idea is to match commands in the Kodi keymap with a corresponding button on the remote. Below is an example starter keymap for a Harmony 650. This keymap covers most of the essential commands for navigation and playback and is a good launching point for a more elaborate key design. Click here for a complete list of Kodi keyboard commands. *Start Kodi – The command Win + # is a means of opening a program in Windows. The # refers to the program's position on the Taskbar. Pressing Win + 3, for example, would open the third item on the Windows Taskbar. Click here for a complete list of Kodi Action IDs. Click here for a complete list of Kodi built-in functions. More information on the formatting and contents of a keyboard.xml can be found here. Link: Another take on how to bind a key to a custom command. ShowKey is a great little app designed to provide a textual display of key commands received by Windows. This app will show both key presses and Windows Media Center app commands. 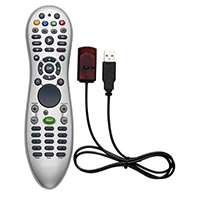 To use, simply point your remote at the receiver and press a button. The corresponding command will appear on the screen. I suggest using the program's copy function to retrieve each key press and put it into an Excel spreadsheet or Word document along with the name of the pressed button. Once we know the commands for each button, the next step is to translate choice commands into Kodi functions. Any command that is not a native Kodi keyboard or app command can be used to create a custom function in Kodi. The Harmony keymap will be a combination of native commands recognized by Kodi and those defined in the keyboard.xml. 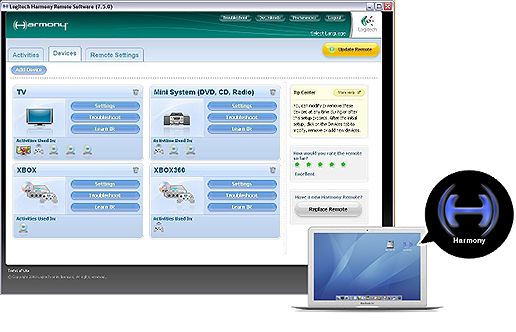 The Harmony database treats non-eHome receivers as Windows Media Center devices. Accordingly, the name of each button references its function in Windows Media Center (e.g. Browser) not its combined key presses. Sometimes, a process of elimination is required to determine the origin of button names on the original remote and cross-reference it with its name in the Harmony database. Below is a starter keymap for a Harmony 650 used in conjunction with a VRC-1100. This keymap covers most of the essential commands for navigation and playback and is a good launching point for a more elaborate key design. *Start Kodi – In this example, Kodi is started through the use of an AutoHotKey script, which is covered in Section 7. The command Start (Windows Key+Alt+Enter) (or #!Enter if referenced directly in the script) is used as the hot key to initiate the script, which opens Kodi.exe. With any Harmony remote, some degree of input lag will be experienced while navigating the Kodi interface. This slight delay is normal. However, this lag can be minimized by adjusting two settings for each Kodi device. MCE Keyboard responds to some commands either too many times or only occasionally. Windows Media Center SE responds to some commands either too many times or only occasionally. If anyone can improve the technical accuracy of this section, it would be welcome. At this point, it is more an art than a science. I have gotten the best results with the settings posted. I'm not really sure about the Input Delay, as I've used anywhere from 300 to 1000 ms.
AutoHotkey is a useful utility that can be used to assign hotkeys (actions) to select key commands. For those unable to use the Windows Media Center SE device, creating a HotKey script is a means of assigning a key combination to start Kodi from Windows. A tutorial on how to create and execute AutoHotKey scripts is found in this post. Place the shortcut to the AutoHotKey script in the Windows Startup folder. Further automation, such as ensuring Kodi loads focused and fullscreen is handled by Launcher4Kodi. You can also configure the Harmony software to send out the Start command at the start of the Kodi activity, if this is desired. EventGhost is an alternative method of configuring a remote by using macros to assign Kodi functions to your Harmony. The program is plugin-based, meaning device profiles must be added manually before macros (functions) can be assigned to these profiles. A tutorial on how to use EventGhost with MCE remotes is found in this post. This poster proposes an additional method of starting Kodi from Windows by changing the shortcut assigned to Kodi.exe. This method is untested. Launcher4Kodi is a HTPC helper utility that auto-starts Kodi on power on and auto-closes Kodi on power off. It can also be used to ensure Kodi remains focused when loaded fullscreen and set either Windows or Kodi to run as a shell. Those experiencing difficulties due to driver issues or remotes that will not recognize commands should visit this post. I was doing some experimenting today with my own remote and ended up changing the directional & player keys to use Windows Media Center SE due to a belief response time was improved over MCE Keyboard. However, without a latency tester, this response could be in my head. I will leave the debate between using MCE Keyboard or Windows Media Center SE as a primary device to the user. Of course, a combination of the two remains desirable to fill-out a keymap. Thread moved to tips and tricks. Nice guide! (2015-03-09, 05:29)Ned Scott Wrote: Thread moved to tips and tricks. Nice guide! Mind if I "steal" some of this for the wiki? Sure, you can use anything you want. Great guide! When I got my harmony 350 and the second hp receiver on the list a couple of weeks ago I experienced a lot of lag and responsive issues until I figured out I was too close to the receiver. I hid the receiver behind the tv and moved away a little and everything started working great. Just wanted to mention this if someone has similar problems. I then have to wait for it to boot back up and login to Windows - the button was pressed when Kodi was running. What do you mean by custom button? Do you mean you have programmed a function in Kodi such as ActivateWindow(home) and this command is causing the computer to reboot? (2015-03-10, 20:53)Warner306 Wrote: What do you mean by custom button? Do you mean you have programmed a function in Kodi such as ActivateWindow(home) and this command is causing the computer to reboot? This sounds like a power setting with your Intel NUC. I would start there. You should only have one device (Windows Media Center SE) to power on your system. This device should be set to turn off when not in use. You could power it on from a complete off state or wake it from sleep/hibernate. Either way, Windows power settings seem like the place to start. I could also be misunderstanding you. You shouldn't be using that button to power off the system. The power button does that job.